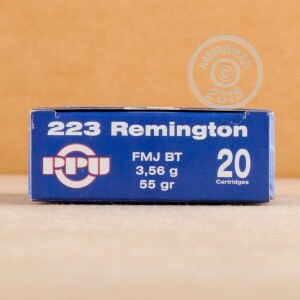 This .223 Remington ammunition from Prvi Partizan is a great choice for target practice with your AR-15 or other .223/5.56 NATO rifle. 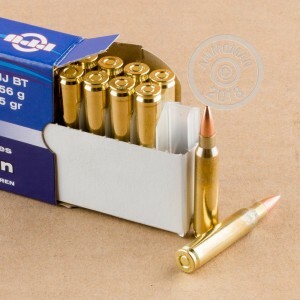 Each cartridge in this box of 20 fires a 55 grain full metal jacket bullet at a muzzle velocity of 3,248 feet per second. These rounds produce similar external ballistics to M193 ball ammo and can be used interchangeably with the domestic mil-spec load without adjusting your optics. 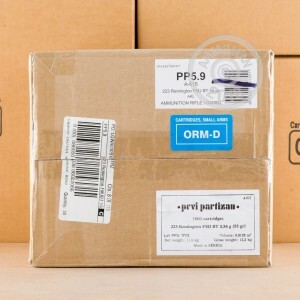 Prvi Partizan (PPU) has been in the ammo business since the 1928s, when it was founded (as the Arms and Ammunition Factory of Uzice) to produce military and hunting ammunition. During World War II, their machinery was secretly used to supply Yugoslav "partisan" fighters resisting Axis occupation. After the war, the former Yugoslav government took over the company and changed its name to reflect this politically useful fact. Today, PPU is once again a public company (although one still majority owned by the Serbian government) and has established a following in the US thanks to the quality and reasonable price of its ammo.